Convenient USB power source for your handy peripherals. Whether it's an LED Light or a small desktop synth, this jack provides 1A of power from an Intellijel power supply to an attached USB device. This tiny module connects (via the supplied two-pin cable) to the +5V bus on the Intellijel TPS series busboard, bringing a handy USB A connector to the 1U row in your Intellijel case, and giving you 1 amp of USB juice, which is suitable for powering many external musical devices, lamps, fans, etc. (NOTE: This module is not compatible with iPhones and their ilk). 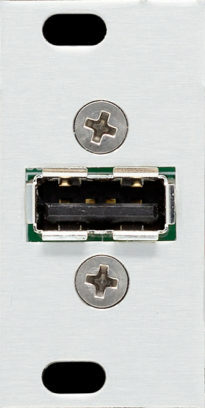 Provides 1A of power for USB peripherals via USB A connection. Uses a 2-pin header so it does not take up a regular module header.